This is one of those recipes I have been making for a few years and just love. 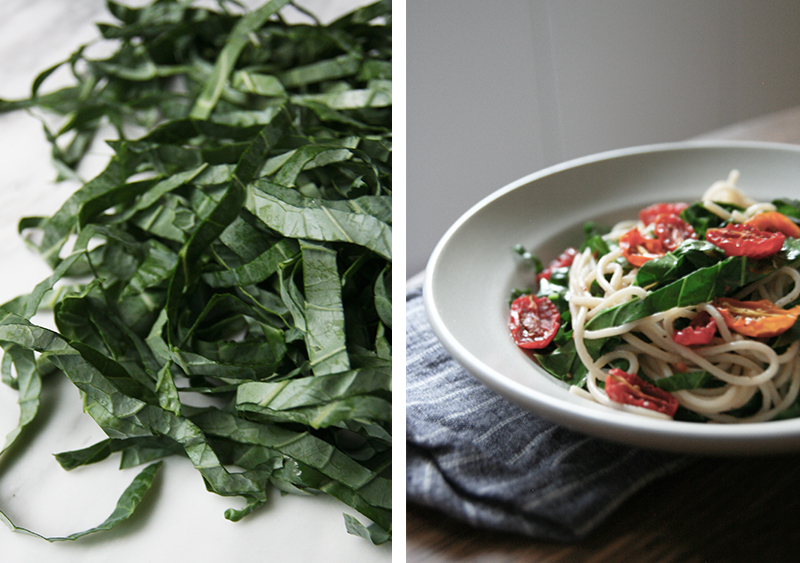 It is a go-to recipe we enjoy almost weekly, Roasted Tomato Green Collard Pasta. Graham likes to call these recipes, “Ella Classics” (HA). It is so fast to pull together and does not take much effort. 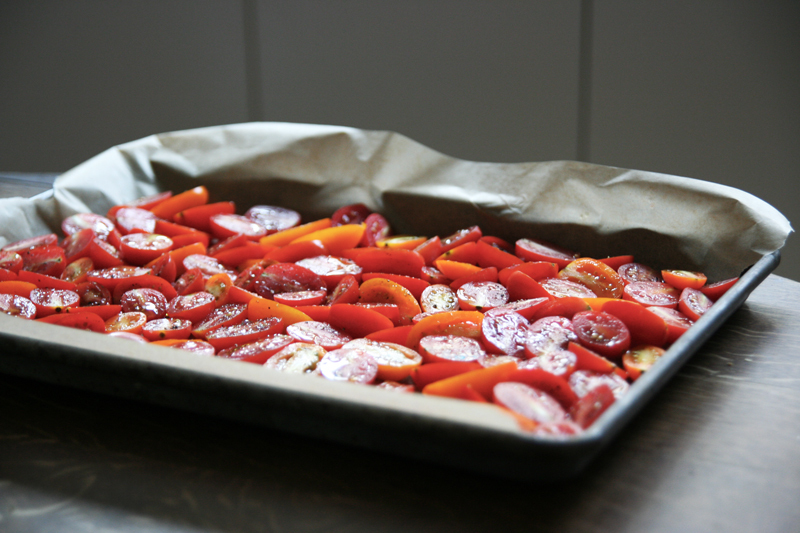 You do need a few hours to roast your tomatoes, but trust me it is worth the wait. My mother would always make pasta like this. Simple, few ingredients and let the in season vegetables beautiful flavors burst through. Recipes like this are all about the ingredients, if you buy the best organic in season vegetables your meal will taste good. Slow roasting tomatoes is one of my favorite things to do with tomatoes at the end of the season. I usually have handfuls upon handfuls of cherry tomatoes from the garden at the end of the season and this is the perfect thing to do with them. They do not all have to be pretty tomatoes either, it is great! 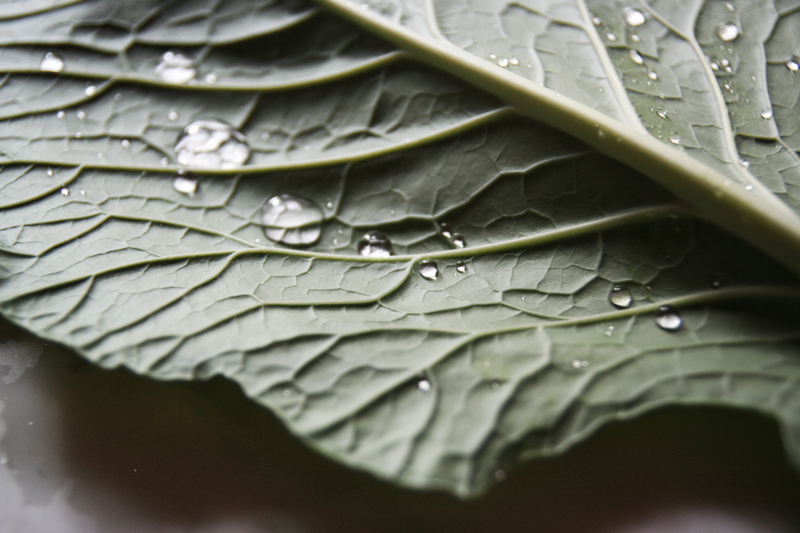 We choose to grow a good amount of dark leafy greens as well in our garden and we have an incredible amount of collard greens waiting to be eaten. When our garden is “bangin”, all we have to buy at the store for this recipe during this time is our brown rice pasta! Brown rice pasta is my favorite gluten-free pasta option. Quinoa pasta is great too, but I somehow can never manage to cook the quinoa pasta without them all sticking together. I find that the brown rice pasta has the best consistency and texture. This recipe is full of texture and flavors. The spice from the red pepper flakes hits you first; these red pepper flakes are totally optional and you can use as much or as little as you prefer. First we need to roast your tomatoes; this takes time but not a lot of work on your end, trust me it is worth the wait. Preheat your oven to the lowest temperature setting it has (mine is 170 degrees F). If your oven does not go down below 200 degrees F, leave the door open while roasting. Cut a sheet of parchment paper the size of your lipped pan. Wash your cherry tomatoes, slice them in half lengthwise and place them “guts up” on your parchment paper lipped pan. Drizzle with olive oil and sprinkle with salt and pepper. Place your tomatoes in your oven for about 4-5 hours depending upon the size of your tomatoes and temperature of your oven. Want to make this meal but you are going to be away at work all day and cannot leave your oven on? You have some options, 1. Make your tomatoes the night before 2. While you are getting ready in the morning have them roasting in your oven, when you are ready to leave turn off your oven and leave them in the oven while you are at work (7-9 hours). Your oven can rest at about 100 degrees if you do not open it. Doing it this way, just takes more time but you have it! Then when you come home from work they are there ready for you. 3. 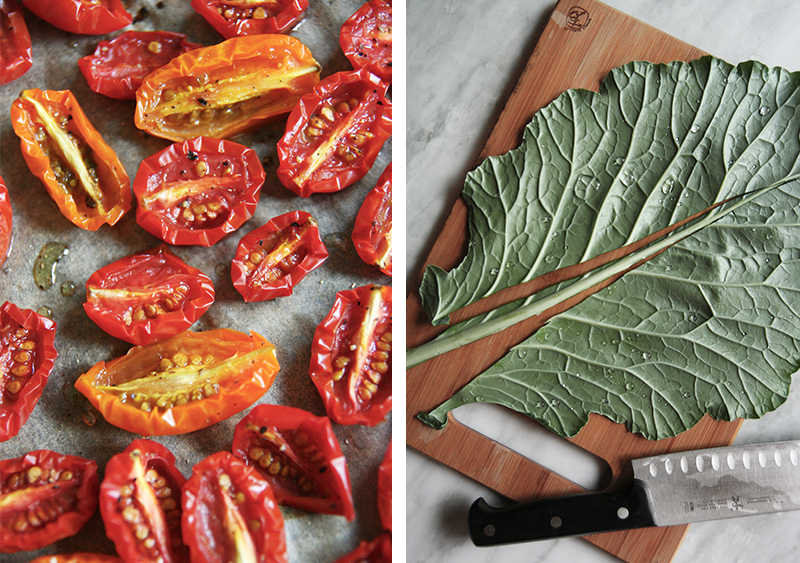 You do not have to roast your tomatoes, simply wash and slice lengthwise. 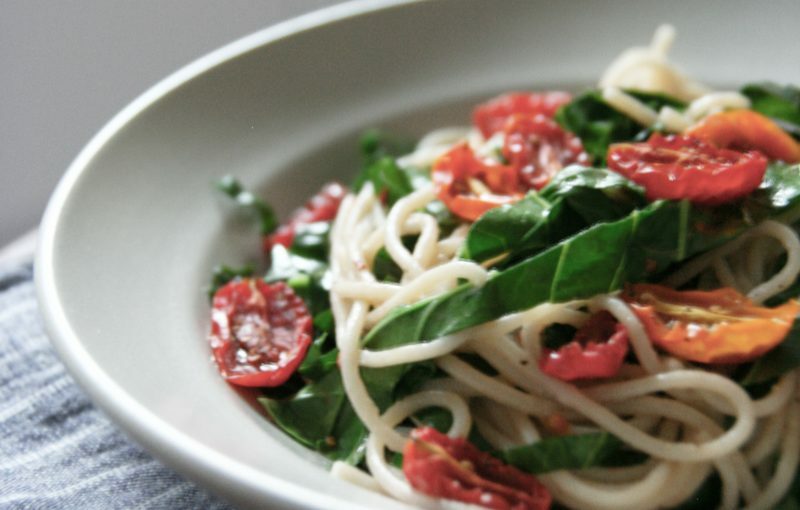 After you have your roasted tomatoes this meal is really fast to pull together. Bring a large pot of salted water to a boil. While waiting for your water to boil, wash your collard greens and set aside in a stack. One at a time, de-vein or cut out the large vein down the middle. Stack a few de-veined leaves on top of one another or do them one at a time. Fold leaves in half and then roll them like a cigar. 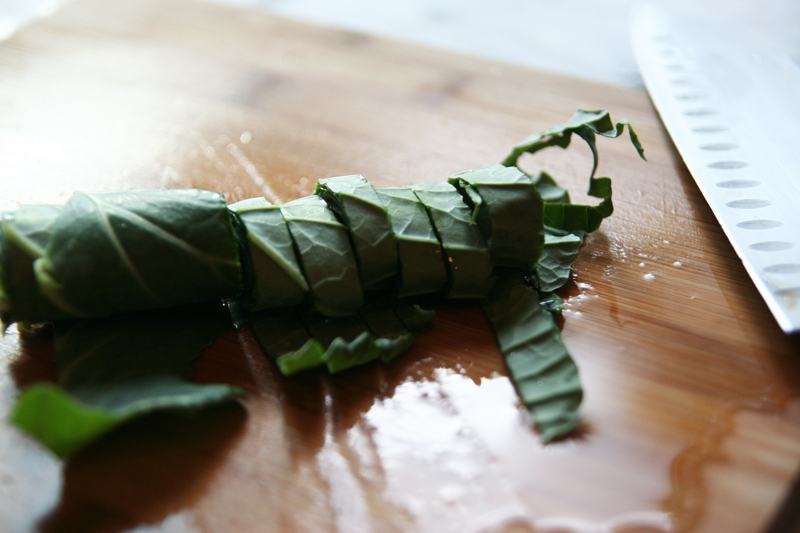 Cut collards into half-inch wide ribbons, then, keeping collards rolled, cut ribbons in half. When your water comes to a boil, add pasta and stir until cooked. In a large skillet on high-medium heat and 2 tablespoons olive oil and your collard green ribbons, roasted tomatoes and red pepper flakes. Deglaze your pan with ½ cup of white wine and turn down your heat to low. Continue to stir and toss your collard greens, then can brown and ugly out of the heat is too hot or sits still. When pasta is ready, add your skillet and toss. Serve with additional red pepper flakes, salt and pepper. You’ve got a great talent, Ella! This looks delish – can’t wait to try it!